We know tires at Redmon's. Not only that, we also know which tires are best for your vehicle. Whether a passenger car or a heavy-duty pickup truck, 2-wheel drive or 4-wheel drive, our team is trained to ensure your vehicle is equipped with the right tires for the job they are supposed to do. 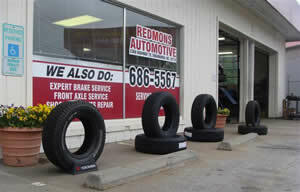 Redmon's inventory of tires include top-name brands as well as other brands of equal quality at a lower price. No matter which tires you choose, we stand behind everything we sell. That's our reputation and we intend to keep it! In addition to providing top-quality tires and tire service, we are also equipped to ensure your tires wear evenly through proper front and rear wheel alignment. Using state-of-the-art equipment, our technicians are able to spot and correct problems before they get out of hand. Remember, pulling to the right or left is not always related to wheel alignment. Problems with tires (especially unequal air pressure), brakes and power steering can also be responsible. 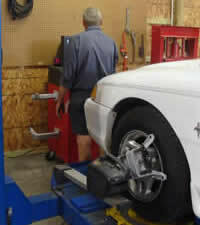 Our wheel alignment technicians are trained to determine the cause and correct it. You can rest assured that your vehicle will drive and handle well after full tire and alignment service at Redmon's Automotive. Copyright 2019 by Redmon's Automotive Service, Inc.